Human beings have always been taken with the idea of understanding how our relationships with each other work and how we can improve them. That’s why, when I was asked earlier this year to choreograph movements for ‘PatternDynamics’, I was drawn to the task. So what’s PatternDynamics? Good question – I wondered that myself. And so I spoke at length with Tim Winton, the creator of the concept, and did a lot of reading on the subject. Here’s my (very brief) summary. 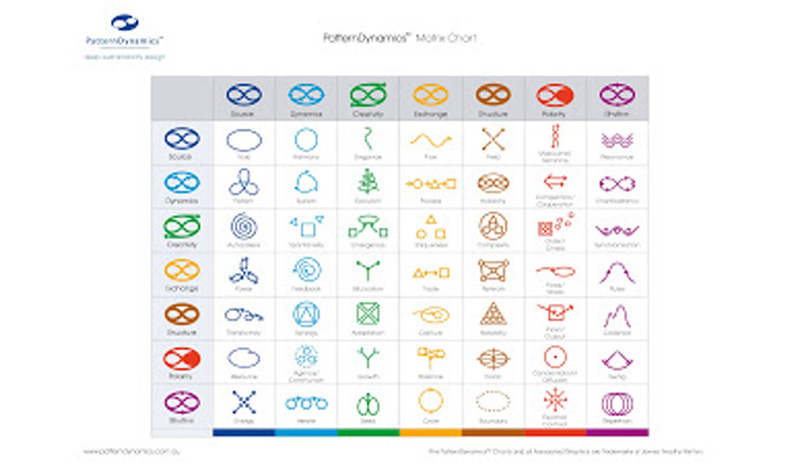 Tim created PatternDynamics as a way of helping us to understand and improve the way we relate to and work with each other based on patterns in nature. Let’s go back a step. The way we interact with our friends, families and colleagues is informed by the dynamic (that is, always shifting) relationships we have with those people. In other words, every relationship has a certain energy (or dynamism) about it. This energy is created by our personal and social expectations of that relationship, as well as our history within that relationship. Not only that, but if we observe our relationships for long enough we can see that there are very definite patterns of behaviour that we engage in within our relationships. Patterns are always occurring in the natural environment. Their repetitive nature means that they often become engrained. The same happens in human relationships, with the difference being that while patterns in nature tend to evolve over time and have clear benefits; patterns in human relationships can sometimes work against us. For example, we can become entrenched in our opposition to certain people or possibilities without clearly understanding why and often to our own detriment. In developing PatternDynamics, Tim was keen to explore why this happened, as well as to discover ways of identifying these patterns and then assessing whether or not they were productive or counterproductive. He also wanted to create a symbolic language that would, through pictures, represent what was happening within relationships at any given time. By developing these symbols, Tim hoped to give people not only a pictorial representation of where they were currently at, but also a symbol that helped them understand how best to move forward. When Tim asked me to develop a way of implementing the movement aspect of PatternDynamics, I was excited. I was especially intrigued by the possibilities of using PatternDynamics to help resolve conflict and to help build unity and creativity.Tim had already thought about the fact that each movement needed to flow from one aspect of PatternDynamics to the next; the trick was that the movements needed to be simple enough so that they were accessible to everyone while at the same time incorporating breathing techniques anda musical beat. Tim has a strong background in martial arts, but (and I know he won’t mind me saying this) he is not the most naturally rhythmical of people (which I soon discovered). Being a dancer myself, and choreographing on a daily basis, I was challenged by the need to develop an accessible series of movements to music without straying into overly creative territory; that is, I had to fight the urge to choreograph something artistically and creatively complex and focus more on making it accessible to all people, especially non-dancers. The focus had to be on the creation of a sequence of movements and breaths that would embody the flows identified in PatternDynamics and be accessible to everyone. Clearly an elaborate movement sequence would miss the point of the principals that Tim and his team were teaching. Likewise, the use of complex music would risk overwhelming participants, leaving them despondent and disconnected from the principals they had learned. In the end, I created a movement sequence made up of 4 x 8 beats per pattern. Movements were very simple and incorporated mainly arms (to make it as accessible as possible to the majority of people) and breathing patterns. The final pattern, which represented ‘Source’ and is a crucial central element in PatternDynamics, simply focuses on the breathing and is about the participant being silent, still and connecting to the whole. I knew that the movement aspect of PatternDynamics could be a little confronting for some participants (especially those who already have an aversion to dance), and so I was keen to make those movements as non-threatening as possible while still being representative of the dynamics identified in PatternDynamics. I was also aware that Tim would be in the perfect position to explain and teach the movement aspect in a way that participants would really enjoy this relaxing yet energising ending to a thought provoking and empowering day. In all, I found this experience to be an exciting, challenging and informative one, and one that certainly opened my eyes to new possibilities in terms of improving human relationships and organisational processes.